If you prefer to operate a decontamination shower solely using an electrical power supply Envirogard can supply twin-shower trailer units to satisfy this. 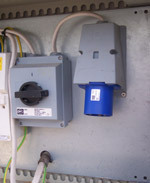 Connection is effected through a trailing socket wired to a suitable mains supply cable; the trailing socket simply plugs into the matching chassis plug located in the grey/beige enclosure on the front of the trailer. We supply the trailing socket. Please note the customer must arrange for a competent person to undertake the connection to the mains supply cable. A single phase electrical power supply is required; most trailers are equipped with a 63amp 240v chassis plug (as shown here). However if your available power supply is limited we also have a number of trailers with 32amp 240v chassis inlet sockets (x 2); these can operate as single shower units with just one 32amp supply, and as twin shower units when the second 32amp supply is connected.